The Jordanian Embassy in Washington said in a statement on September 14, 2018, that all Jordanians residing in the hurricane affected-states are safe. Due to the severity of the hurricane, the Jordanian Embassy staff called upon the Jordanian community residing in any of the affected areas –including students in Carolina and Virginia– to leave these locations and return back once the storm calms down. The Embassy also provided ticketing, accommodation and other necessary services needed to aid the mandatory evacuation of its citizens. Hurricane Florence, coming from the center of the Atlantic Ocean, carries heavy winds. The epicenter of the hurricane is located 216 kilometers east of Wilmington, North Carolina, and has hit the coasts of North Carolina, South Carolina and Virginia. The hurricane had a maximum wind speed of 165 kilometers per hour, after downgrading to category one on the five-category hurricane scale. Hurricane Florence hit the coast of North Carolina on Thursday, September 13, 2018, and was accompanied by torrential rains that prompted meteorologists to warn of a potential flooding in southeastern areas of the United States. The National Hurricane Center (NHC) has been updating their reports around the clock, including latest measurements of Storm Helene and Hurricane Florence. 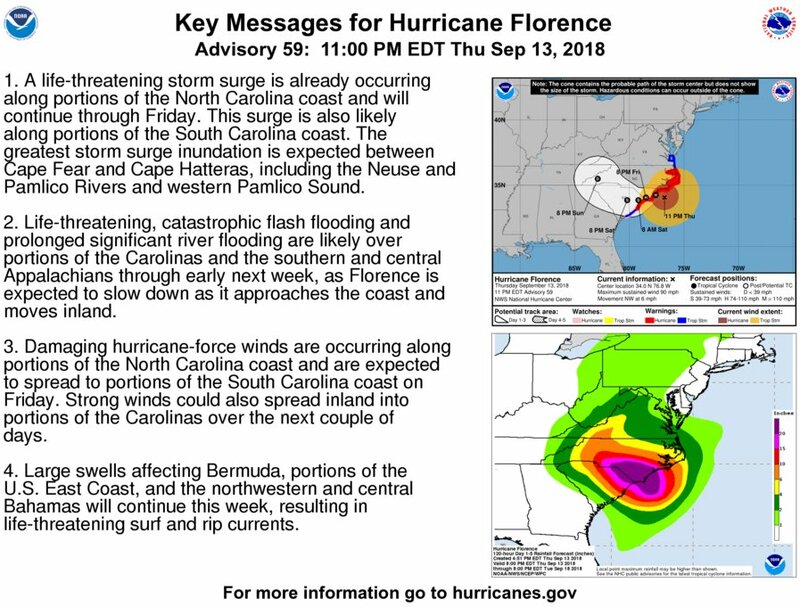 In an announcement published earlier today, the NHC stated that Hurricane Florence is producing a life-threatening storm surge and hurricane conditions over portions of eastern North Carolina. The threat of freshwater flooding will increase and spread inland over the next several days. The center of the hurricane is expected to hit the southern coast of North Carolina on Friday, September 14, 2018, and then drift south-west before it enters land on Saturday, NHC said, adding that the heavy rains will reach 40 inches in some areas.